Laura Gump and her mentee, Laila Jones, a Senior at SVA can hardly believe that their 4 years of mentorship with S/PA are drawing to a close, but it’s clear that they will remain close for years to come. When Laura first met Laila as a freshman, she could have never predicted how close the two would become. After they shared their first breakfast at SVA, Laura started scheduling monthly lunches at SVA where the two of them would share stories over lunch. Most mentees may not be aware that you can schedule meetings with your students on school grounds during lunches and free periods. Although not required, meeting with your student at school is a neutral and safe place that can help strengthen the relationship. 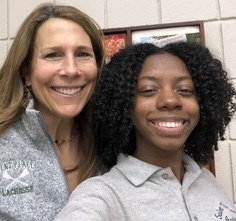 Laila always requested fast food for lunch when she was a freshman, but since then, Laura has introduced Laila to healthier options and now opts for fresh fruit, a special type of yogurt and La Croix seltzer water. Over time, Laura and Laila have grown quite close, and Laura has also gotten to know Laila’s mother, going so far as hosting her wedding this past summer at her lake house! Each mentoring experience is different, but Laura reminds us that mentors often get as much, if not more out of the mentoring experience.